How to draft an Application for the position of head boy at your school? When you are applying for a role as class head boy, we have the right letter template for you. Overall you need to emphasize why you are the best candidate for the role of Prefect and I would be very pleased if you would consider me as I would like to be able to help the school in return for my last year. I look forward to hearing back from you soon. 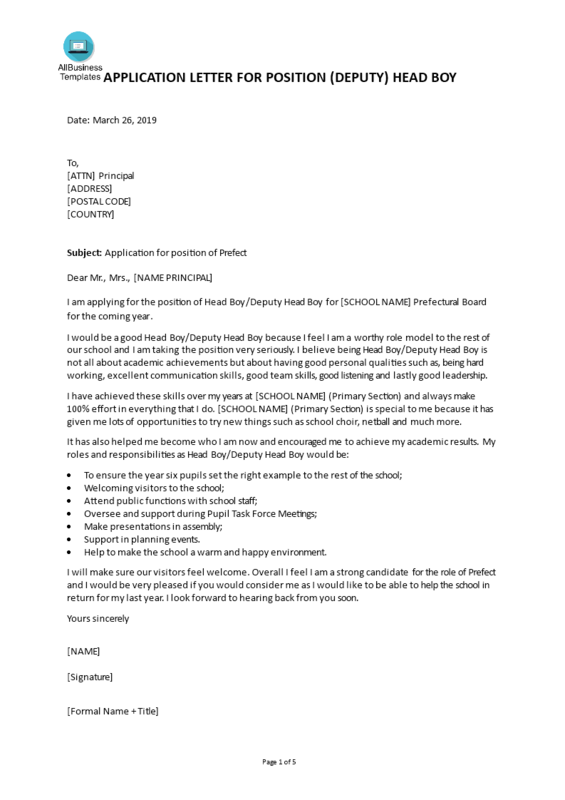 Overall you need to emphasize why you are the best candidate for the role of Prefect and I would be very pleased if you would consider me as I would like to be able to help the school in return for my last year. I look forward to hearing back from you soon. Certainly have a look at this Application for the position of class prefect template, which will save your time and efforts and help you to be more successful in your studies! Help to make the school a warm and happy environment. Make sure our visitors feel welcome. We certainly encourage you to download this Application for the position of class prefect now and to use it to your advantage! Download this Application for the position of the class perfect template that will perfectly suit your needs! Looking for another type of Educational template, please type in the right keywords in our search bar or browse through our database. AllBusinessTemplates is one of the most popular platforms for downloading document templates and is updated every day with new Education Templates!